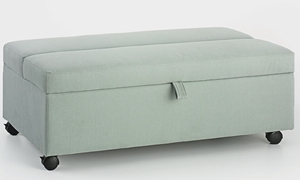 Whether a guest needs a place to sleep, sit or simply prop up his feet, this space-saving sleeper ottoman will prove itself as a versatile living room accessory. It comes upholstered in gray LiveSmart stain resistant fabric, so you and your guests can use this piece as a footstool or cocktail table without worry. Simply pull back the top to reveal the sleeper inside, equipped with a comfortable twin size gel foam mattress. 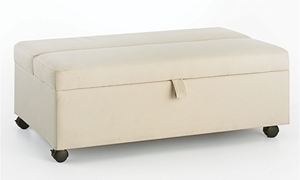 Thanks to the casters beneath, this ottoman can easily be repositioned and rolled from the family room to another space in your home, making it great for apartments and condos.